The Contract Management (CM) function enables the processes of creating, negotiating, and executing all of the legal obligations, contracts and agreements for an organization. It also encompasses the storage and analysis of these documents for reference by both business and legal personnel. The various contracts necessary for acquiring new customers, known as sell-side, and the multiple contracts and working documents for managing vendors and suppliers, known as buy-side, are the typical subjects thought of when considering contract management. Additionally, contracts necessary in the day-to-day course of business operations such as non-disclosure agreements, leases, employee contracts, and more, must be managed. All companies that have contractual agreements participate in the contract management domain, sometimes unknowingly, using various People, Process, and Technology strategies. Contract lifecycle management (CLM) is a category of technology that is designed to maximize contract visibility and automation. Billing Statement - 'Bill': A periodic document that reflects transactions across that period, including new invoices/charges, payments or adjustments to previous invoices, and typically provides a total balance due. 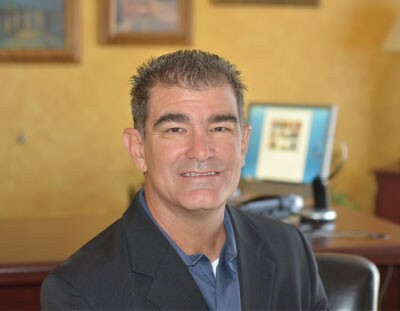 "Many of our more mature clients have complex contract assembly requirements, extensive clause libraries, and require a sophisticated and tightly coupled integration between their selling (CPQ) and contracting (CLM) solutions. We encourage our clients to understand the holistic implications of this integration and how they must balance revenue goals with appropriate risk and compliance." Document creation is the process of assembling a contract, and typically involves combining a template of business and legal language with content specific to the obligations being agreed to by the parties involved. In some cases, document creation is the process of manually drafting the entire document. A clause library and templates enable an organization to create consistent contracts, reducing the need for close legal oversight. On the sell-side in particular, the effective management of clauses and templates improves the speed and quality of the sales and approval process while mitigating risk to the company. Templates contain the standard language, placeholders for variable content, and any logic necessary to support conditional content, as well as the stylistic formatting of the document. Clause libraries contain independent clauses that can be used by authorized users during contract creation and negotiation. For instance, a clause library will typically include legally-approved alternate language that can be used to replace a specific section of standard language in the template. "Clients have a wide range of contract generation needs from a simple table of line items with minimal legal language to a multi-page, highly complex set of terms and conditions with cross-contract dependencies in numerous localities. The contract template is much more than just the font, spacing, and numbering of the resulting executable. Now about that contract you want to be rendered in Klingon..."
Once the originator has officially offered a contract, any changes to the document by either party will result in readily distinguishable redlines. Contract management systems have various methods of tracking these redlines and their acceptance or rejection. Sell-side focused business often have documents such as master service agreements subjected to redlining. 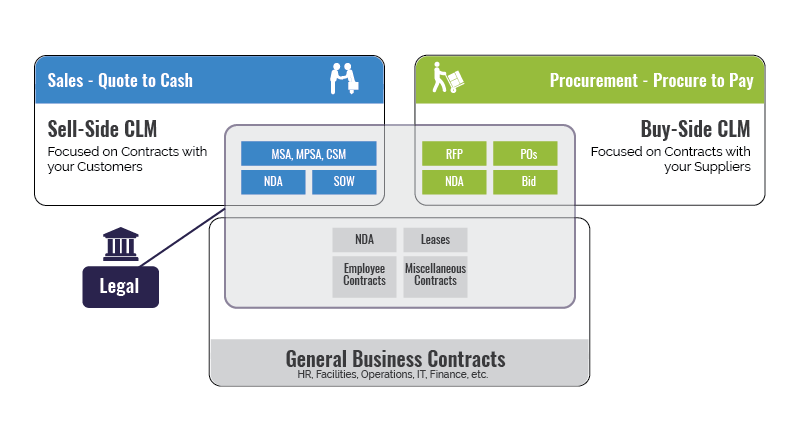 Contract management workflows are used to guide the contract through the standard and conditional paths the contract may take during the creation, negotiation, and execution process. For example, the workflow can guide any contract that the customer has redlined directly to legal for review. 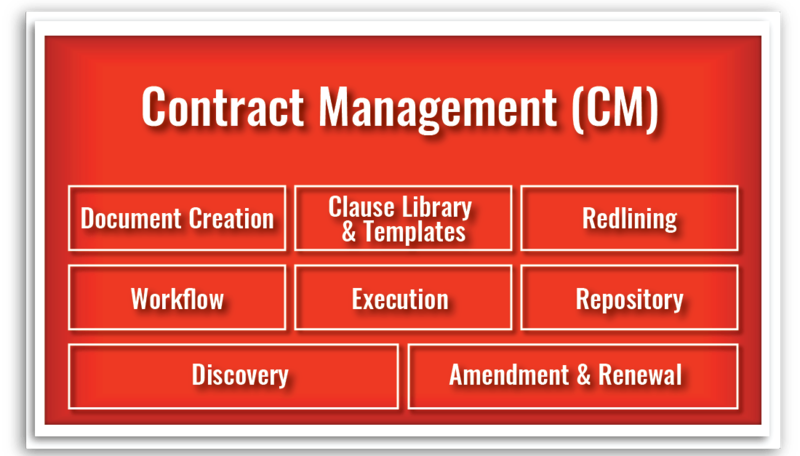 Contract management workflow can reside within a CLM tool, as an extension of configure-price-quote (CPQ) workflow, or via an enterprise workflow solution from a business process management (BPM) suite or document management tool. Successful generation and negotiation of contracts result in execution. In most cases, execution occurs once both parties have signed the contract. Execution is often a milestone in the Quote-to-Cash process and may trigger provisioning, fulfillment and implementation activities. Organizations typically store executed contracts in a secure repository which can ensure that authorized users only can access confidential content. The use of metadata tags relative to the content of the contract enables the discovery and retrieval of the contract for future purposes. The discovery capability enables users to search for existing contracts or content. An account manager may want to discover all of the contracts for an existing customer or a lawyer may need to discover any contracts that have an outdated clause and the respective customers. Discovery conducted by businesses who have sell-side contract management needs typically fall into two categories. The first type of discovery is to support revenue which involves searching for renewal, up-sell, and cross-sell opportunities that protect or enhance the company’s revenue position. The second type of discovery finds service obligations to identify performance responsibilities that may be under or over-served to clients. Discovery is also commonly performed for other legal and compliance purposes. Corporate legal teams are often underserved during process and technology optimizations, but when ATG implements a CLM tool, the legal team receives a new level of automation, visibility, and overall document management agility. 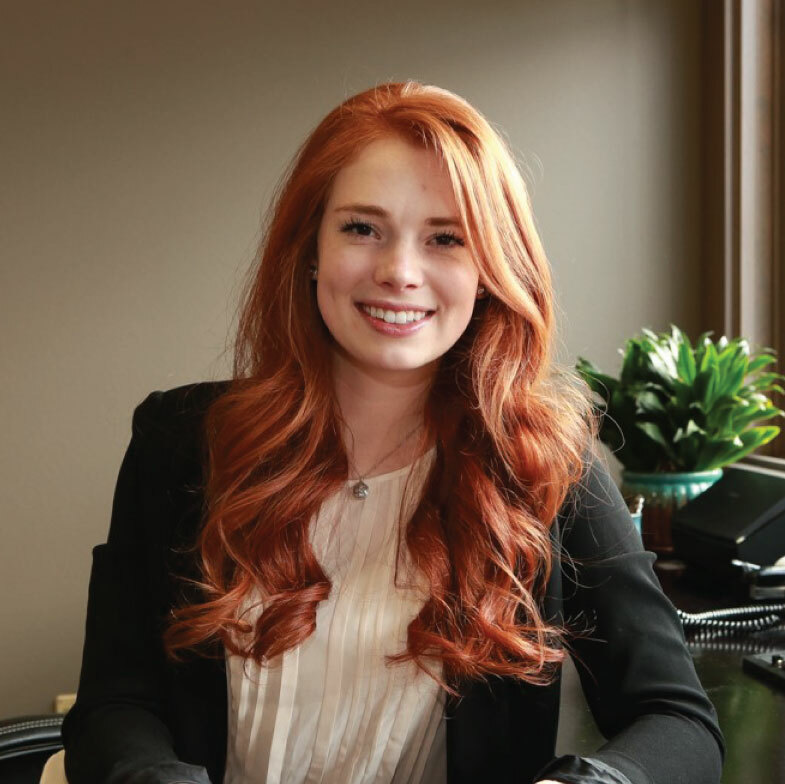 The levels of excitement and cooperation displayed by the legal teams I’ve worked with are unmatched, and it is so rewarding to be able to improve their day-to-day work experience! Many businesses generate more revenue from and extend engagements with their existing customers than with their net new customers. 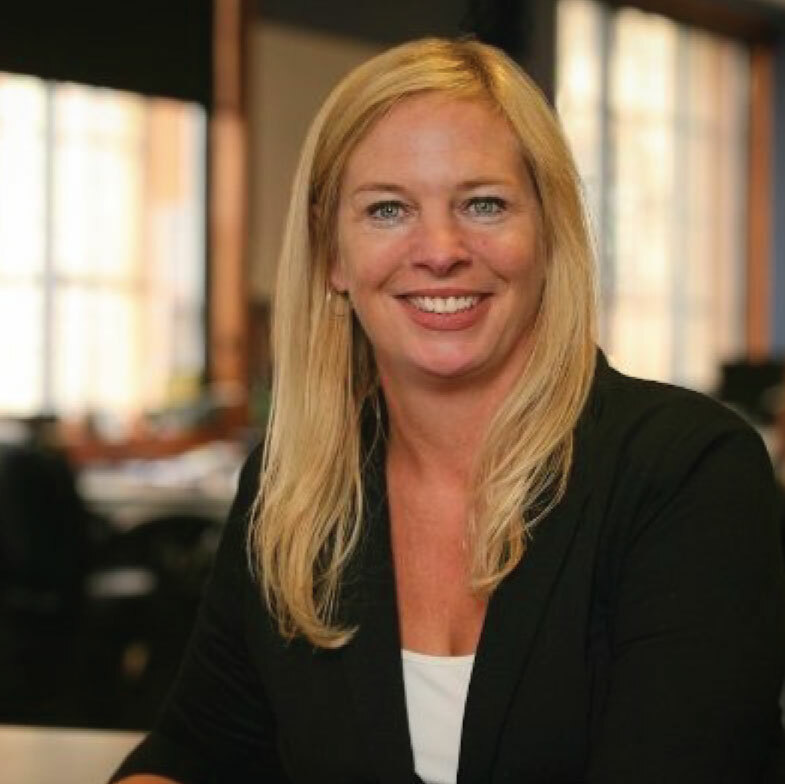 This revenue stream makes the renewals a critical process, and the ability to process these essential transactions with visibility and the appropriate degree of automation is vital for a healthy business. Amendments and renewals that require signature exercise many of the same contract management functionalities as net new contracts. Amendments and renewals often are generated using templates, may follow workflows, require execution and storage in the repository, and need to be discoverable. Contract management is primarily the legal department’s responsibility, but sales, procurement, vendor management, and human resources are also heavily involved. In buy-side contract management, the legal department collaborates with the procurement department to verify that the corporate finance and risk outcomes are appropriately balanced. In sell-side contract management, the legal department confirms that contracts created by the sales department have appropriate risk mitigation and take into consideration any compliance requirements. Contract management has distinct creation, approval, and discovery processes. However, it is best known for being a component of the selling processes of Quote to Cash and the buying processes of Procure to Pay. ATG maintains a set of 75 key business processes to support management of customers and revenue for our clients. Below are some of the key processes that are touched in contract management, categorized by the organizational unit that owns the process. Quote: Product Configuration – configuration of feature and attributes of products and services prior to a sale. Quote: Product and Service Pricing – configuration of product and service pricing available through the quoting tool. Quote: Product and Service Discount – configuration of product and service discounts based on certain criteria (e.g., volume discounts, geography). Up-Sell Processing: Initial Order – selling a customer a separate, better product or service from what they had originally expressed interest in during the needs assessment. Cross-Sell Processing: Initial Order – selling a customer a separate product or service from what they had originally expressed interest in during the needs assessment. Partner Transaction Management – oversight and integration of any third-party re-seller or partner transactions, including selling, licensing, and billing. Renewal Processing – methods used to continue a customer’s services beyond the contract’s expiration period. Maybe an automated or manual process. Contract Management – Contract Management is the process of negotiation, redlining, electronic signature, versioning, and storage of contracts. 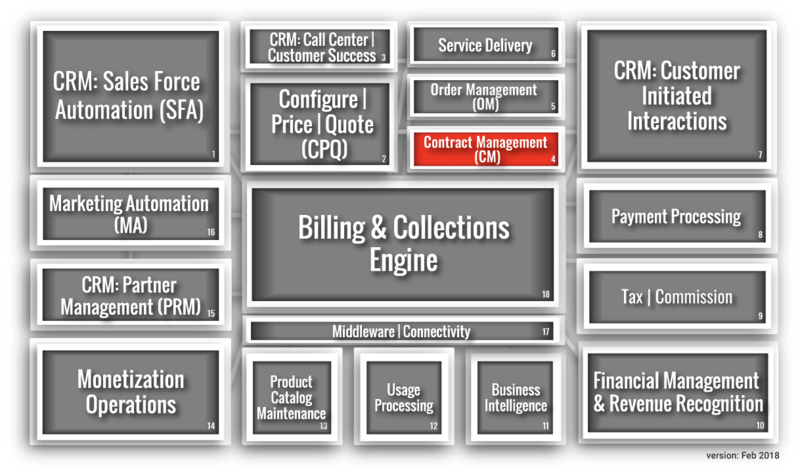 Numerous technologies have supported the contract management function for many years. Email routing, workflow-based contract management tools, and document management tools have all been part of an automated or semi-automated contract management toolkit. Recently, the technology category of CLM has emerged and gained traction with many of our customers. We see the following CLM tools increasing their relevance to our customer base, and these tools have an emphasis on sell-side CLM. SpringCM is a document management platform that provides highly scalable, secure, and reliable solutions. The platform can close business deals faster and make it easier for customers to work with you. When your documents flow, work flows. SpringCM has applications to perform document management and workflows; however, its leading application is for contract lifecycle management. SpringCM integrates into Salesforce giving users complete access to manage their documents. SpringCM targets mid to large enterprise companies across many industries. Conga Contracts streamlines and accelerates contract negotiations for sales teams, so they can close deals faster without leaving Salesforce. Key contract automation capabilities include a robust repository, granular security controls, flexible routing and approval rules, and reports that are automatically generated and emailed. Conga Contracts bridges the gap between CPQ and eSignature, creating end-to-end contract automation with your existing solutions. Conga Contracts for legal and operations (formerly Novatus) addresses the unique and complex challenges of keeping business moving while mitigating risk to the company. The acquisition of Octiv will extend the Conga Suite by providing the ability to create, collaborate and manage web-based documents while measuring engagement throughout the lifecycle of a document. Conga Contracts targets organizations in many industries. Target organizations are medium to large enterprises and are looking for a CLM tool in Salesforce for their sales team. Apttus offers Quote to Cash solutions fueled by the Apttus Intelligent Cloud, which maximizes the entire revenue operation by streamlining and improving business processes, aligning and driving revenue winning behaviors and recommending relevant, intelligent actions. The Apttus Intelligent Cloud is powered by the cloud platforms including Salesforce and Microsoft Azure and can be accessed within popular CRM solutions including Salesforce and Microsoft Dynamics CRM. Apttus targets organizations in many industries and of any size. SAP Ariba‘s platform includes a Strategic Sourcing Portfolio to manage the entire sourcing, contracting, and spend analysis processes for all types of spending, direct and indirect materials as well as services, all in one place. A component of this portfolio is SAP Ariba Contracts which provides enterprise-wide management of all contract functions (including the buy-side and the sell-side). A partnership with DocuSign delivers electronic signatures capabilities. A professional version is required to receive features such as contract authoring and integration with Salesforce. SAP Ariba contract management targets many organizations, providing solutions to those who need buyer support or supplier support. Advanced Software Concepts (ASC) Contracts software provides buy-side and sell-side contract management and contract lifecycle capabilities. ASC also provides web-based enterprise management solutions for documents, forms, and pricing and quoting. All ASC management software comprises automated document creation and a searchable repository or database with built-in reporting, compliance and audit trail capability. ASC targets organizations in many industries. Target organizations are any size, and ASC contract lifecycle management and business process solutions improve customer, vendor and supplier relationship and commitment management; simplify business processes; ensure compliance, reduce contract risks, and increase efficiency. Concord is an all-in-one cloud-based contract lifecycle management platform. The Concord platform is designed to manage contract authoring, track approvals, enforce workflows, and audit contracts. Users can edit contracts through the cloud, and with the built-in e-signature functionality, contracts can be legally executed through the cloud as well. Concord integrates with various systems including Salesforce and Google Docs. Concord was built and designed so that corporations across many industries can benefit from its offering. Small to medium businesses may best utilize the Concord contract lifecycle management platform. The Exari Contracts platform is built to address the full spectrum of contracting challenges across buy-side and sell-side contracts. This platform includes a global repository, wizard-based document generation, workflows, and reporting using artificial intelligence. 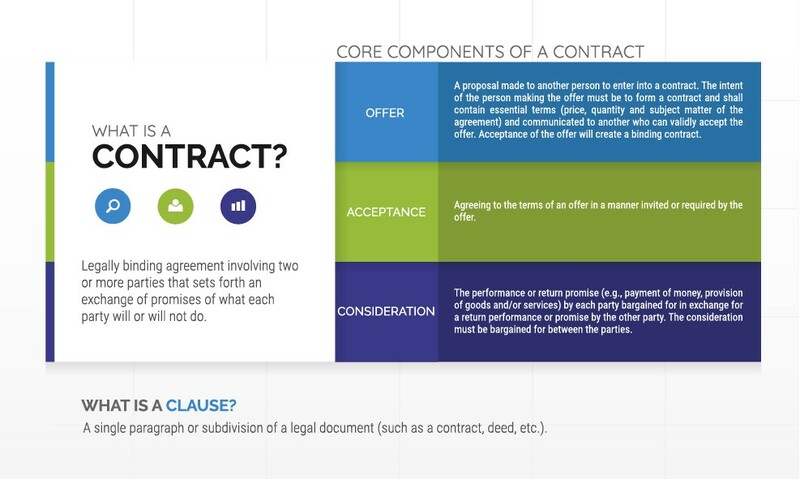 Additionally, Exari Contracts can translate legal terms into actionable data using Exari’s Universal Contract Model. Exari Contracts targets organizations across many industries. Target organizations are typically medium to large enterprise sized businesses. The Icertis Contract Management (ICM) platform has standard contract lifecycle management features and also offers specialized business applications to solve industry-specific problems. Leveraging ICM platform’s artificial intelligence and natural language processing, Icertis Experiences enables users to interact with the ICM platform in the applications where they spend the majority of their time. The ICM platform is used by more than 750,000 users in 90 countries and 40 languages, managing over 2.5 million contracts with a total value of $320 billion. Icertis Contract Management targets enterprise organizations in many industries. PandaDoc is a document-focused platform with native apps built to enable proposals, contracts, quotes, and electronic signatures. There are 21 integrations available within common customer relationship management systems such as Salesforce. PandaDoc targets organizations across many industries that can benefit from fast and accurate proposals and quotes. PandaDoc Contracts may be best suited for mid to large enterprise companies. Seal Software is the leader in AI-powered contract discovery, data extraction, and analytics, for Global 2000 companies. Although Seal Software is not a true contract lifecycle management technology, it transforms contracts into valuable sources of business intelligence for business transformation and strategic planning. Seal Software targets mid to large enterprise companies in finance, high tech, healthcare, life sciences, and legal services.